Quasi-periodic pulsations (QPPs) with periods from a few seconds to several minutes are often observed during solar/stellar flares in X-ray, radio, and optical wavelength bands. The study of QPPs is useful to understand the physical mechanism for the energy release, plasma heating, and particle acceleration during solar flares. The excitation of QPPs is generally explained by several possible mechanisms, e.g., (i) bursty magnetic reconnection associated with formation and ejection of multiple plasmoids, (ii) coalescence of current carrying loops, (iii) modulation of reconnection by MHD waves (slow-mode or fast-mode waves) (see Nakariakov and Melnikov (2009) and references cited therein for more detail). The generation mechanisms of QPP are not well understood and need further investigations using latest high-resolution multi-wavelength observations. In this nugget, we present an interesting QPP (period about 3 min) observed in EUV, HXR, microwave, and metric/decimetric wavelengths (Kumar et al. 2016). Based on the multiwavelength analysis, we investigated the excitation mechanism for the observed QPP. 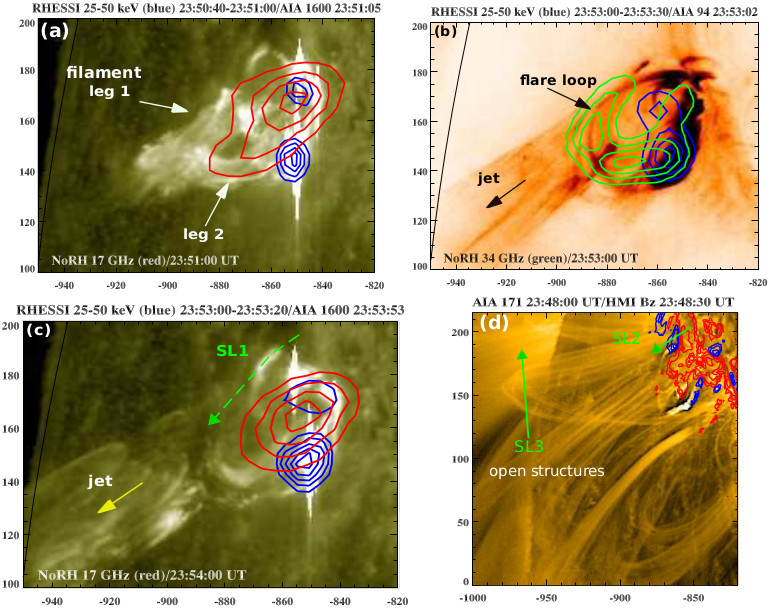 The QPP reported here was observed during an M1.9 flare, occurring in active region (AR) NOAA 11302 on 23-24 September 2011. The flare was triggered at the periphery of the AR, where the fan-shaped loops and open structures were observed. 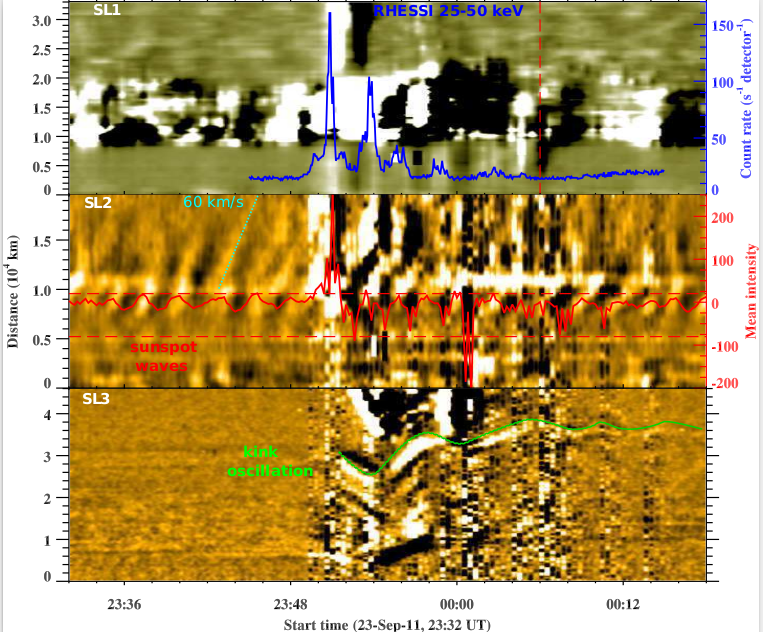 The flare started at ~23:48 UT, peaked at ~23:56 UT, and ended at ~00:04 UT (Fig. 1a). Figure 1: (a) GOES soft X-ray flux profile in the 1–8 Å channel and its time derivative (red). (b) RHESSI hard X-ray flux profiles in 12–25, 25–50, and 50–100 keV channels. (c) NoRP flux profiles in 2, 3.75, 9.4, and 17 GHz frequency bands. (d) Learmonth dynamic radio spectrum in 25–18 MHz frequency, showing bunches of type III radio bursts. (e-h) RSTN radio flux density profiles in 245, 610, 8,800, 15,400 MHz frequencies from the Learmonth solar observatory. In the 25-50 keV channel the QPP shows five peaks with decaying amplitude. Similar behavior was observed in microwave, metric/decimetric radio channels (Fig. 1). Also, as we observed ∼3-min periodicity in type III radio bursts (below 300 MHz), microwave bursts (above 1 GHz), and HXR bursts (25-50 keV) simultaneously, therefore, it indicates the bi-directional acceleration/injection of the non-thermal electrons from the acceleration region/reconnection site. First of all, we investigated the source region of QPP. The AIA and Hinode SOT images reveal the formation of a quasi-circular ribbon during the flare, suggesting a fan-spine magnetic topology. We detected a small filament lying under the fan loops (Fig. 2a). The kinked filament rose slowly and interacted with the pre-existing ambient field. This interaction generated a coronal blowout jet (Fig. 2c) associated with a coronal mass ejection (CME). We see the formation of two footpoint sources (25-50 keV, blue contours) and most likely a loop top source (NoRH, 17 GHz). The underlying flare loop (green contour) was observed in NoRH 34 GHz (Fig. 2b). We detected the untwisting motion of the filament material with an almost 3-min period. Therefore, the rising filament interacts with the overlying pre-existing field and can periodically trigger magnetic reconnection at the null point resulting in quasi-periodic injection of nonthermal electrons toward the footpoints of the fan loops leading to the formation of the quasi-circular ribbons. Figure 2: (a,c) AIA 1600 Å images overlaid by RHESSI (25-50 keV, blue) and NoRH (17 GHz, red). (b) AIA 94 Å image overlaid by RHESSI (25-50 keV) and NoRH (34 GHz). The contour levels are 30%, 50%, 70%, 90% of the peak flux. (d) AIA 171 Å images with HMI magnetogram contours of positive (red) and negative (blue) polarities. We observed repeated umbral flashes (AIA 1600 Å) before the flare onset at 23:32 UT onward. Interestingly, we noticed the increase in the umbral intensity by the periodic precipitation of nonthermal electrons during the flare (Fig. 3, top panel), which is co-temporal with the RHESSI hard X-ray flux (25–50 keV, blue curve). The intensity change was consistent with the AIA 1600 mean intensity profile and HXR profile, therefore, it is likely that the intensity change could be a result of particle precipitation near the sunspot. Fig. 3 (middle panel) shows the propagating EUV disturbances, going from the sunspot along slice SL2 (AIA 171 Å). Their apparent (i.e., projected) speed is subsonic for the temperature associated with these EUV channels, and hence they are interpreted as slow magnetoacoustic waves. In our case, the apparent speed of a front is ∼60 km/s. A comparison of the timing of sunspot oscillations with the RHESSI hard X-ray flux profile suggests a high correlation between them. Therefore, it is very likely that the reconnection is periodically modulated by the slow-mode waves leaking from the sunspot. The slow-mode waves can reach the reconnection site in the fan-spine topology and periodically trigger the energy release by the mechanism described by Chen & Priest (2006) and Sych et al. (2009). We observed kink oscillations of a small loop (131 and 94 Å) at the flaring site, with a period of ∼4 min. In addition, we also observed kink oscillations of the overlying arcade loops (period ∼6 minute, Fig. 3 bottom panel). The kink oscillation period does not match the period of the observed QPP (∼3 minute). Therefore, we can rule out the modulation of the periodic reconnection by the kink oscillation of the nearby loops. Figure 3: Top: Stack plot of the AIA 1600 Å running difference intensity along slice SL1 shown in Fig. 2c. Blue curve is the RHESSI HXR flux profile in the 25–50 keV channel. Middle: Stack plots of the AIA 171 Å running difference intensity along the slices SL2 and SL3 (refer to Fig. 2d) showing 3-min waves leaking from a sunspot and the 6-min kink oscillations (green, bottom panel) of the overlying arcade loops, respectively. The red curve shows the mean intensity extracted between two horizontal lines shown in the middle panel. (i) The QPP was most likely generated by the interaction of the untwisting (kink unstable) filament with the preexisting ambient fields in a fan-spine topology. Two different structures of the small filament reveal rotation in the opposite directions simultaneously with a period of ~3-min. The unstable filament may trigger the periodic reconnection at a null point in a fan-spine topology. This mechanism is consistent with our previous findings (Kumar et al. 2015). 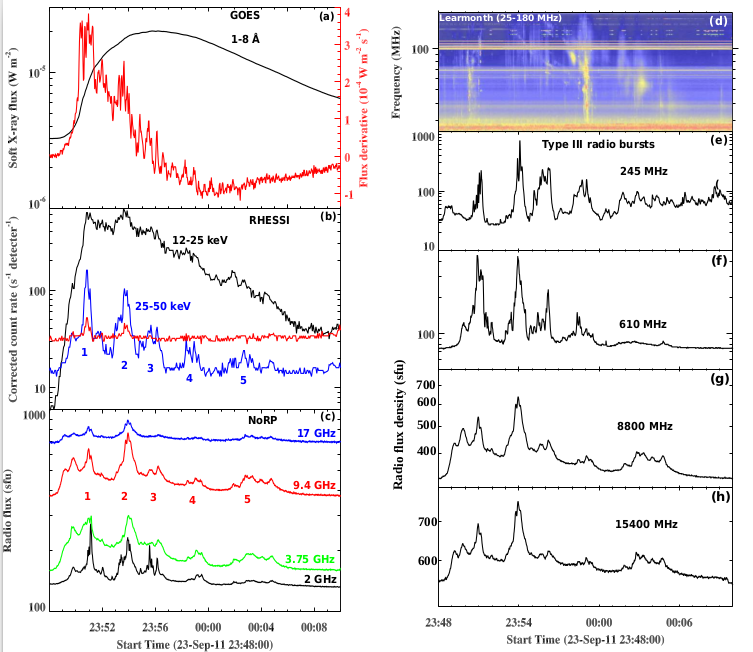 (ii) We also observed the leakage of slow-mode waves (~3-min period) from a nearby sunspot at the flare site. The waves highly correlated with the 3-min QPP observed in the HXR/microwave/EUV channels. Therefore, we suggest the periodic reconnection modulated by sunspot slow-mode waves may generate the QPP.